The Insatiable Eater: Dabbous: is it still worth the wait? Dabbous is still one of the hardest tables in London to secure. If you search the website for a prime time slot a month from now, you'll be told there are no tables within the next eight weeks and probably just give up. The reason for the supply/demand mismatch is that it's a relatively small room with a little more than a handful of tables meaning demand remains high two years after it opened. I went to Dabbous shortly after it opened, but the week before Fay bestowed a glowing five stars on it, and have never been able to get another table since without planning more than six months ahead. Frankly, I'd given up ever eating there again too. But one good turn on my part (an invite to join me at Sushi Tetsu) was repaid with reservations at Dabbous. See? Karma is a beautiful thing people, so be nice to each other out there. 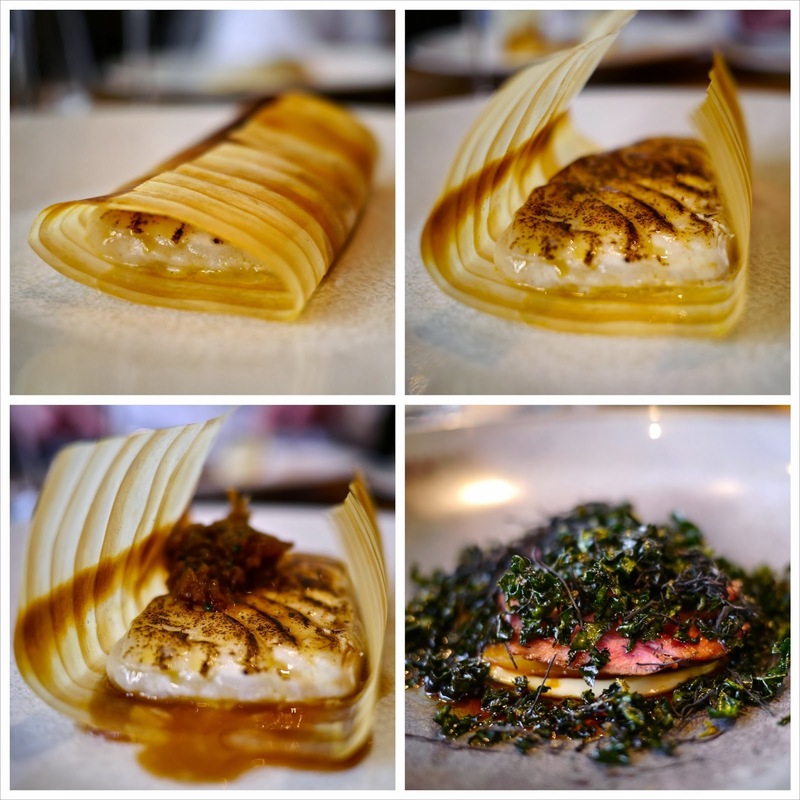 I loved my first visit to Dabbous, finding the food incredibly refreshing and light and, in general, that deft touch remains today. The tasting menu I had this week contained only one repeat dish from my first visit (the final dessert), although I was secretly hoping that the coddled egg would be on the offer again (it was sadly taken off just before Christmas). This time around, I found the menu slightly disjointed, with some quite heavy courses (such as the Mash & Gravy) feeling a little out of place next to some of the lighter courses such as the delightful avocado starter, which I think is where the chef excels. We started on a dish called Avocado with Basil, Almonds in a Chilled Fig Leaf Broth, and it was the best course of the meal. The picture I've taken doesn't do the dish justice - hiding beneath the broth and the creamy ripe avocado were roasted almonds and various herbs. Each fresh mouthful had great texture thanks to the roasted nut and were sometimes punctuated with a fresh acidic herby burst. It was more like a palate cleanser. A little "hello, how are we doing today?" kinda dish. I loved it. Course two kept to the deft touch with smoked halibut (first picture). They weren't shy in the smoking of the fish which I liked. The celeriac was cut into long julienne and stayed crunchy thanks to the light pickling. I wasn't quite sure what the perfectly boiled egg was doing there (that yolk looks like a stunning Machiavelli to me), but I enjoyed it nonetheless. We then changed gears with a dish of Mash & Gravy. Imagine a silky purée of Joel Robuchon-richness and you're part way there. Smothered with a ladle of turkey gravy, I think this dish could evoke Ratatouille-like childhood memories. A few delicious mouthfuls in and we were convinced that it contained cheese (a sort of take on the French aligot), but there was none - just cream, butter and nutmeg. A few more mouthfuls though and this dish hit the bottom of my stomach with a thud. Perhaps it is possible to have too much of a good thing. In contrast, the next fish course was so gently cooked, the meat could be flaked apart with the gentlest of touches. It was presented encased in the overlapping wood shavings which we unfolded and dressed with a blob of the honey and turnip dressing. Delicate flavours that didn't overwhelm the cod. Another rich course followed but I found the roast goose with birch sap and white miso to be too sweet for my liking. The goose was cooked rare and sliced thinly but presented shrouded in a cloud of deep fried chopped cavalo nero. Beneath the goose were thin slices of salsify. 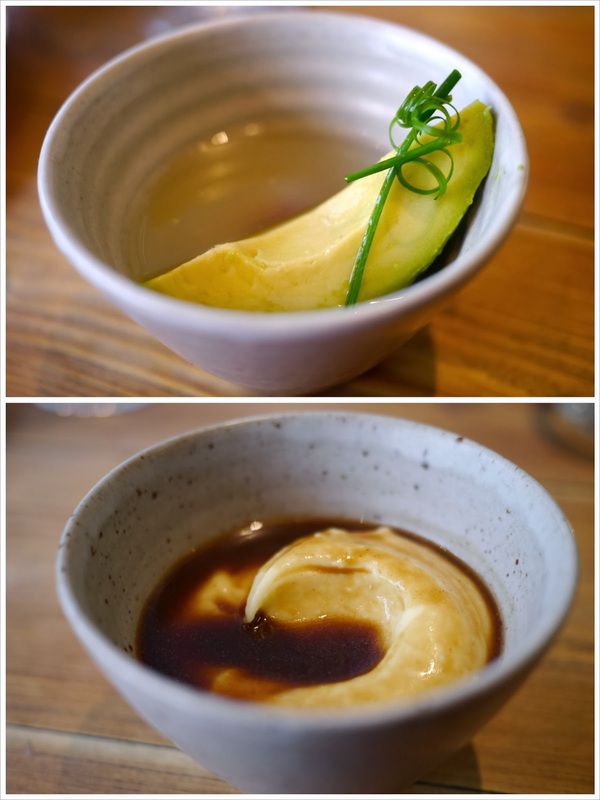 This was an interesting dish, and the first few mouthfuls had great textures but ultimately I found the sweetness (maybe from the miso preparation or a reduction of the birch sap) cloying. Desserts saw us back in more familiar territory. Thinly sliced sweetly sharp rhubarb was bathed in a light infusion with the flavours occasionally interrupted by bursts of lavender. We flirted with grandma's soap territory here, but the slight citric tang from the ice lettuce kept us reasonably grounded. We rounded things off with the final dessert of Chocolate and Hazelnut Ganache with Basil Moss and Sheep's Milk Ice Cream. This beautifully constructed dish is a dense, rich finale to the meal. 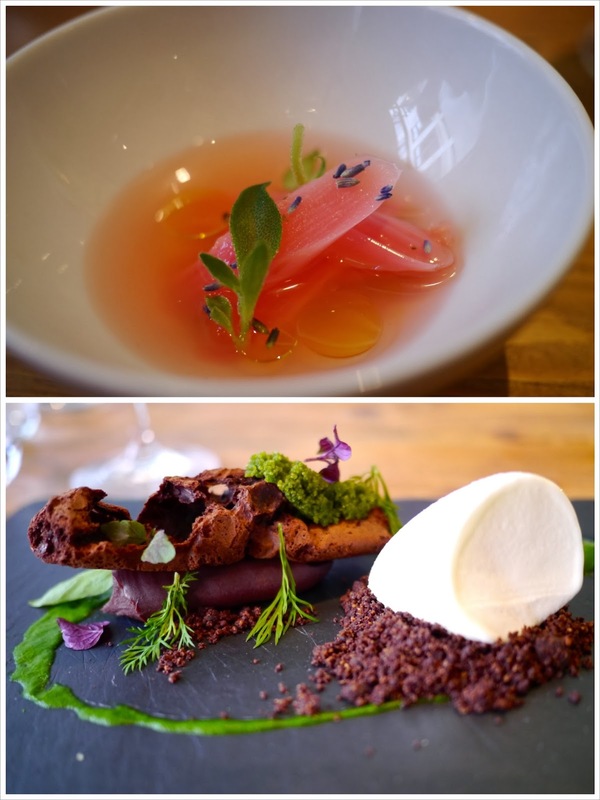 The freshness of the herbs (dill and basil) counter the ganache, while the ice-cream has a measured sourness. There's a comfortable assuredness to Dabbous which makes it an enjoyable place to while away a few hours (we spent about three hours there without any pressure to move on). It's a well oiled machine with friendly, knowledgeable service on both the food and wine front. We drank a light and well matched carafe of Pinot Blanc from the Alsace (£15) and a few glasses of Jurancon (£7 each) with dessert. While the price of the tasting menu has crept up a smidge over the last two years it's still a relative bargain at £59 for the seven courses. With the wine, the meal came to £315 for four of us. Although there were a few courses that I didn't love, Dabbous continues to create some interesting (this is not a euphemism for bad!) food. 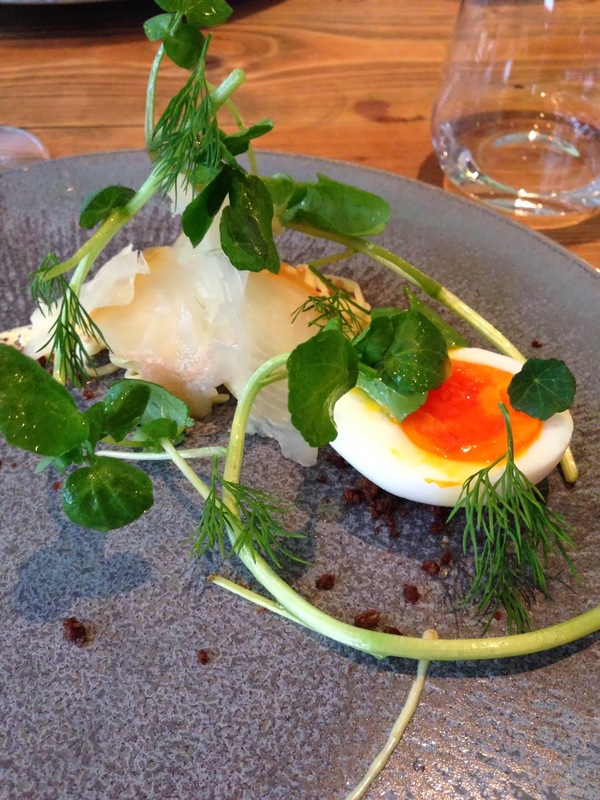 So is Dabbous still worth the long wait for a table? Well, competition is fiercer now than when Dabbous opened with places like The Clove Club, Kitchen Table and Restaurant Story doing innovative stuff and vying for your attention. Despite that, I'd definitely return because there are flashes of brilliance here. If you want to test the waters without the lengthy wait for a reservation, head for Oskar's Bar downstairs where selections from the menu can be ordered (including, sometimes that egg) along with a terrific cocktail.